Whale watching was a top priority on my bucket list for a long time. Four years ago, my husband and I booked a whale watching tour in Dominica and saw no whales at all. 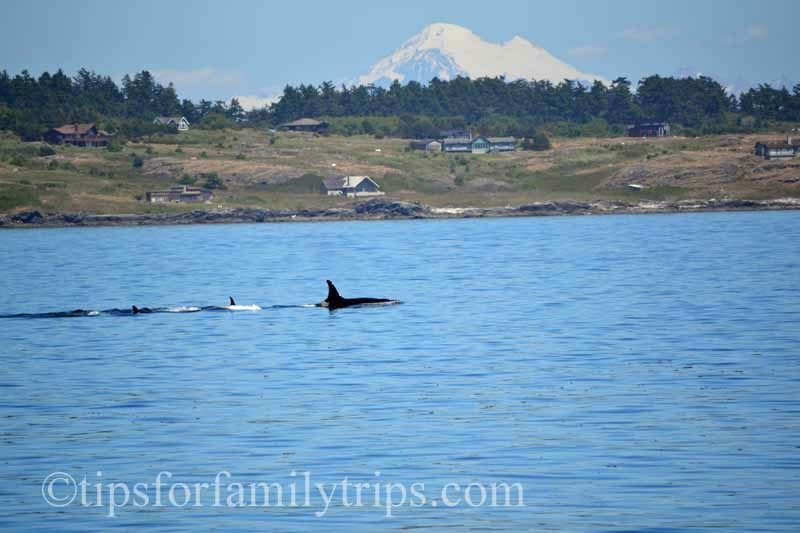 It was so disappointing and I worried that we would have the same experience when we booked a whale watching tour on our recent trip to the San Juan Islands in Washington State. It turns out that we could not have chosen a better day for our tour with San Juan Excursions. The weather was perfect and the whales and other wildlife were abundant. We experienced the best case scenario, and finally checked whale watching off the bucket list! Here is what you can expect on a whale watching trip with San Juan Excursions. One pod of orca whales stays near the San Juan Islands year round, and two pods spend the summer months here. The resident pod is J Pod. The other two are K Pod and L Pod. There are about 80 orcas between the three pods. The best months to see orcas in the San Juan Islands are May through September. We were very lucky that our tour fell on the day that J Pod met L Pod for the first time in months. So, there were more orcas to see, and they were displaying social behaviors that you may not see on a typical day. We heard vocalizations above the water, saw tail slaps, and lots of social play. Our on-board naturalists, who see these animals just about every day, were beside themselves with excitement. The law requires that boats stay 200 yards away from the animals, so most or all of your views and photos will be from a distance. However, seeing an orca in the wild from any distance is an exhilarating experience. We also spotted a minke whale on our trip with San Juan Excursions and you may see humpbacks or grays as well. Harbor seals are abundant in the San Juan Islands. Photo courtesy of San Juan Excursions. We also saw harbor seals, sea lions, porpoises, a bald eagle, jellyfish and a variety of sea birds on our whale watching trip. My animal loving 8-year-old son is still talking about all the animals he saw on this tour, and has been learning more about them on his own since our trip. We spent hours traveling on ferries through the San Juan Islands on this trip and saw very little wildlife on our own. Traveling on a smaller boat with a captain and naturalists who know where and how to spot wildlife makes a huge difference. San Juan Excursions reports a 90% success rate for seeing orcas. However, they cannot guarantee a sighting, so they will give you a rain check for another free tour if you don’t see a whale the first time. There is no expiration date, so you can redeem the rain check years later. If you’ll be on the San Juan Islands for a few days, it’s a good idea to schedule your whale watching tour early so you have time to go again, if needed. San Juan Excursions will take you out on the Odyssey, with front, back and inside viewing areas. It does have bathrooms and a small cash snack bar. Water is provided at no additional charge. The Odyssey holds 80 people, but there were only 16 on our tour. There was plenty of space for everyone to spread out and see the wildlife. If you want to enjoy a smaller tour, aim for a weekday during the shoulder season or off-season. Each tour has two naturalists who will talk about and point out the wildlife on your tour, and otherwise do their best to provide you with a great experience. They know these whale pods well enough that they can identify many of the orcas by name. If you have binoculars, this is an excellent opportunity to use them. San Juan Excursions has a limited number of binoculars available for loan on the Odyssey. There is no charge to borrow the binoculars, but you’ll need to provide your driver’s license or other ID as collateral. You’ll want to bring your camera or video camera on this trip, and if you are a skilled photographer with good equipment, all the better. The rest of you will be happy to know that the naturalists have a good camera with a big lens and will also be taking photos, which they will share by email after the trip. We received a link to the photos within a couple weeks of returning home. This is a great whale watching tour for families. All children under age 12 are required by law to wear a life jacket at all times on the Odyssey. Life jackets will be provided when you board. There were four children between two families on our tour. Each child was given the opportunity to wear the captain’s hat and drive the Odyssey for a minute or two on our way back to Friday Harbor. Jacket, even on a warm day. If it’s chilly outside, consider a coat, gloves and winter hat. Disclosure: My family received a complimentary whale watching tour from San Juan Excursions and the San Juan Islands Convention and Visitors Bureau for the purpose of review. I received no additional compensation and all opinions are my own. This is a minke whale. Photo courtesy of San Juan Excursions. Where: You can book a tour or check in for your tour at the shared office of San Juan Excursions and Crystal Seas Kayaking at 40 Spring Street in Friday Harbor. It’s just a couple of doors up from the dock. Tours begin at the dock in Friday Harbor. When: Tours are offered each afternoon, year-round. Reservations are recommended. Book online or call 1-800-809-4253. How Much: Rates vary by day and season, but expect about $95 per adult, $65 per child (ages 3-12), no charge for infants. Don’t forget a cash tip. Ask about discounts for military, seniors, teachers, college students, AAA and groups. Tips for families at South Dakota’s Bear Country U.S.A.
What a thorough look at a whale watching trip in a beautiful area. Thanks for all the tips!